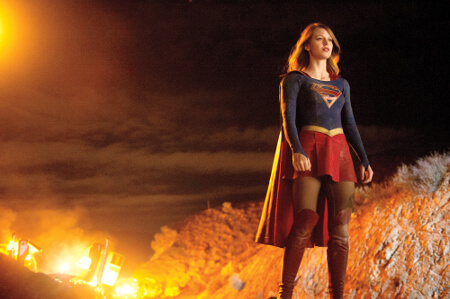 Melissa Benoist stars as the title superheroine on the CBS TV show "Supergirl", but before she had the power to save the world, Melissa was a girl from the Lonestar State. She may have been borm in Texas, but Melissa actually grew up in Littleton, Colorado. After high school she was off to the big apple to pursue her dream of performing. I didn't take long to get noticed as a talent for Melissa - she auditioned for the hit TV musical drama series "Glee" in 2012, and went on to land a recurring role for Season 4 and 5 of the show as Marley Rose. She married her "Glee" co-star Blake Jenner in 2015. Melissa Benoist went blonde for Supergirl! "Glee" was just the start of Melissa's career - she landed the title role on the CBS comic book-inspired drama "Supergirl"! She plays Kara Danvers/Supergirl. She's said in interviews that she hopes the character is an inspiration for young girls everywhere. “I think [that is] what’s feminism about, it is that it’s for everyone. She has all the same powers [Superman] does." She has appeared in "The Good Wife", "Law and Order" and "Homeland"
Do you watch Supergirl? Let us know in the comments section below!